The eyebobs collection is returning. Shop all-day readers, as well as regular readers and sunreaders. It’s an irreverent and slightly jaded trunk show! 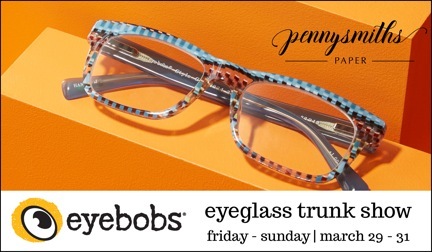 The eyebobs collection is returning to Pennysmiths Paper. We’re happy to announce that you can shop all-day readers, as well as regular readers and sunreaders. Starting Friday, March 29th until Sunday, March 31st you can see it all for yourself. Your spring look is waiting! 10% off orders placed during the show!